But although these cameras have the guts to shoot great video, they're still cameras at heart. Their form factors are built with photography in mind, and using a DSLR for serious video projects often requires the use of a special rig that costs more than the camera itself. A redesigned camera body built for shooting video was bound to pop up sooner or later. In the past few months, it's happened twice. 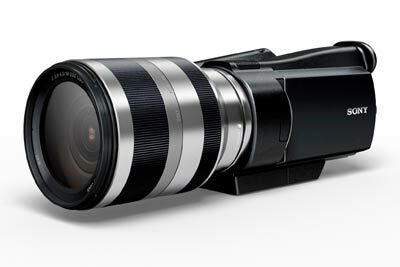 Sony's latest camcorder announcement represents the second interchangeable-lens video camera that will be available by the end of the 2010, hot on the heels of the Panasonic AG-AF100 Micro Four-Thirds System camcorder announced in April. 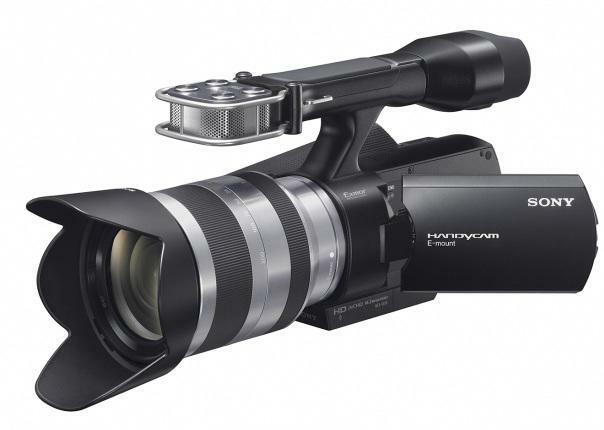 The Sony NEX-VG10 shoots 1920-by-1080 AVCHD video at 60 interlaced fields per second (you're fixed at that 60i frame rate) and maxes out at a 24mbps bit rate for video capture. It offers manual video controls (shutter, iris, white balance, and gain), manual still-image controls (full manual, aperture priority, and shutter priority), and manual focus controls as well as more beginner-friendly auto settings. The NEX-VG10 offers the same Exmor APS HD CMOS sensor and E-Mount lenses as the Alpha NEX-5 and Alpha NEX-3 compact cameras announced earlier this year; the same lens-and-sensor combination performed extremely well in our lab-based video tests for the Alpha NEX-5. Sony unveiled an early prototype of the NEX-VG10 in May this year. Sony's new camcorder will ship with a new optically stabilized 18-200mm F3.5-6.3 zoom lens, and the video camera has a 1.5X focal length multiplier for all E-mount lenses; as such, the kit lens offers a 27mm to 300mm reach in 35mm film equivalent. A $200 A-Mount adapter is available for using Sony Alpha DSLR lenses with the camcorder. On the still-image side of the equation, the NEX-VG10 borrows a few things from the Alpha NEX-5. It captures 14-megapixel still images and offers a 7-frame-per-second burst mode, as well as some of Sony's cooler in-camera features, such as Handheld Twilight mode and a High Dynamic Range setting. After using the NEX-VG10 for a few minutes during a recent demo, it became clear that Sony didn't just slap an interchangeable lens mount onto a camcorder; the scene modes and controls for both video and stills make the NEX-VG10 a refined and versatile double-duty weapon. Weighing in at around 1.3kg, it's not the lightest camcorder on the block, but holding it via its top-mounted handle rather than its side-mounted hand strap lessened its heft quite a bit. The NEX-VG10 is primed for serious audio capture, thanks to a cluster of four directional microphones on the top of it, as well as a proprietary hot shoe and standard cold shoe under a door on the camcorder's handle. In addition to a flip-out 3-inch LCD viewfinder, the NEX-VG10 has an eye-level EVF that swivels vertically, and the camcorder saves footage to a single card slot that accepts both Memory Stick and SDHC/SDXC cards. The NEX-VG10 is slated for availability in September for $2000; that's about one-third of the rumored price for Panasonic's interchangeable-lens AG-AF100 camcorder, which doesn't have official pricing or release-date information at this time. With multiple frame rate options and full 1080p AVCHD video capture, Panasonic's Micro Four-Thirds camcorder is geared more toward professional videographers; there are also far more Micro Four-Thirds lenses available at this time. According to Sony, however, the NEX-VG10 boasts a bigger CMOS sensor despite being positioned more toward the prosumer end of the video spectrum. That US$2000 price and range of features should be low enough to entice a lot of filmmakers.